Neighbors returned recently from a dinner at the Charlemont Inn with tales of being fed squash pizza. As a fan of both squash and pizza, I was intrigued. It was only a matter of time before I fed a version of this dish to my family. My success was mixed although generally positive. As I note in the recipe below, I think the squash needed more spices to offset its sweetness. And it DEFINITELY needed the thinnest crust possible. On the other hand, the color was pretty gorgeous, and we definitely ate the slightly sweet/slightly spicy combination. So I have decided to post the recipe. If any of you try it (and/or adapt it), please let me know what you think! I’ll probably make it again next fall and post an update. Preheat the oven to 350 degrees. If your pizza dough is refrigerated, take it out of the fridge so it can come to room temperature while you are doing the rest of the work. Place a Dutch oven on the stove top, and heat a couple of tablespoons of oil in it. Toss in the onion and garlic and sauté until they begin to brown. Place the pan in the oven, uncovered, and cook for 20 minutes, stirring from time to time. Stir in the water and continue to cook, covered, until the squash is very soft—about 1/2 hour longer. Remove the pan from the oven, and mash the squash and remaining water together. Preheat the oven as indicated in your pizza dough instructions. Mash in a little liquid to make the squash puree spreadable. Next, roll and/or stretch the pizza dough out gently (this may take a few tries) so that it forms a 14-inch circle (or a rectangle to go onto a cookie sheet if you don’t have a pizza pan). Use a little flour to help with this if necessary. 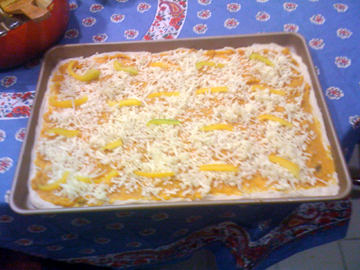 Spread the squash puree on top of the crust, and top that with the grated cheese. Arrange the pieces of pepper onto the cheese topping. If you are using a thicker pizza crust, you may want to cook the crust a bit before you spread the toppings on so that the pizza cooks all the way through. This entry was posted on Monday, November 15th, 2010 at 4:00 am	and is filed under Pasta and Pizza, Pumpkins and Squash. You can follow any responses to this entry through the RSS 2.0 feed. You can leave a response, or trackback from your own site. Fun story! I don’t know that I’d have ever thought of a butternut squash pizza, but you make it sound tempting. I’m not too sure about this one ….. I’m of the ‘more toppings the better’ school of pizza making!! 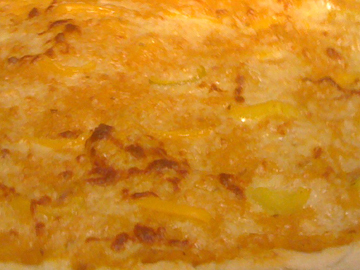 I’ve made a squash pizzas before, but I never mashed them like you did, I bet the texture was incredible comforting. 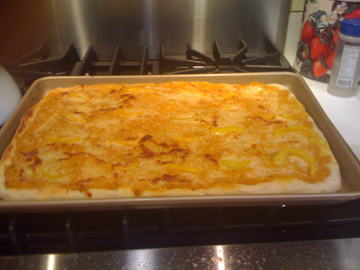 I used my mandolin and thinly sliced mine with some thinly sliced onions and apples and kinda layered it on the crust with some cheese…your flavors all sound great to me-yum! Thanks, Nancy and Elizabeth for encouraging my experiments. EveryDay and Matt, I LOVE the idea of slicing the squash instead of mashing–and of course who could resist the salmon? Frayed, I promise next time I’ll throw on a few more toppings, just for you.